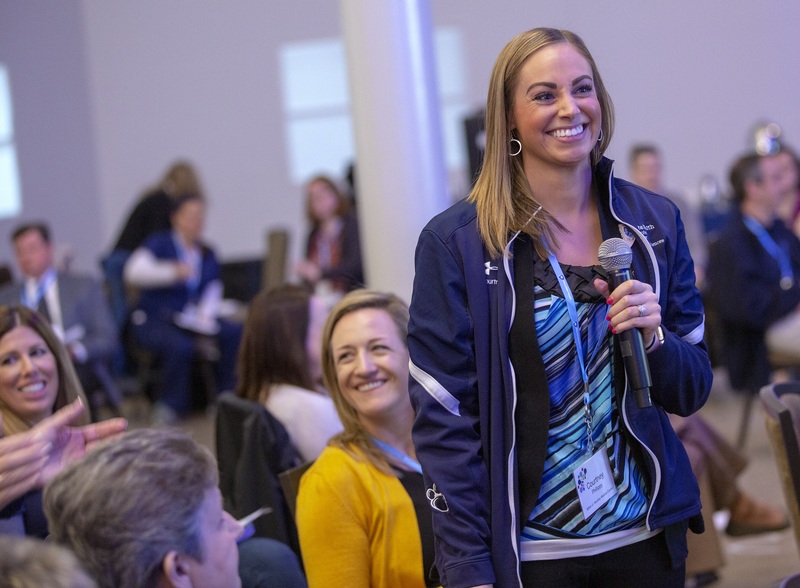 Courtney Phillippy reports her group's feedback during a small group session at the 2019 Leadership Conference: This is Penn State Health. 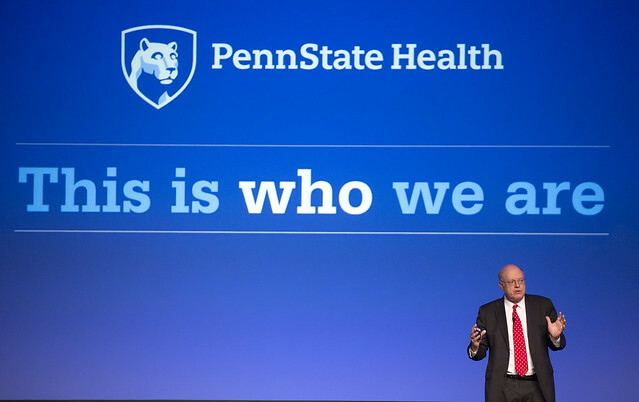 Approximately 750 Penn State Health and Penn State College of Medicine senior leaders and managers gathered to learn how they can better guide their teams to help carry out the organization’s mission at the 2019 Leadership Conference: This is Penn State Health on March 21. Two half-day sessions took place at Spooky Nook Sports Complex in Manheim. Both Massini and Hillemeier explained Penn State Health’s 10-20-30 strategy – ensuring that all residents in the region are within 10 miles of a Penn State Health primary care provider, 20 minutes of a specialty care provider and 30 minutes of acute care. Executives talked about the challenges Penn State Health is confronting, including increased competition for high-end services and reduced referrals as hospitals merge into larger health system networks. Penn State Health is addressing those challenges by expanding current facilities, such as Penn State Children’s Hospital, the Emergency Department at Penn State Health Milton S. Hershey Medical Center, the Cancer Center at Penn State Health St. Joseph Medical Center and the addition of a hybrid cardiac catheterization lab at St. Joseph Medical Center; building new facilities, such as Lime Spring Outpatient Center and Penn State Health Hampden Medical Center, and always seeking to improve quality and safety issues. Tanner Corbridge of consulting firm Partners In Leadership led a session on how to build a culture of accountability at Penn State Health. When some individuals face a problem, they go “Below the Line” by playing the Blame Game, ignoring the issue or taking a wait-and-see approach. Instead, they should go “Above the Line” by seeing the problem, owning it, solving it and doing it. “Make a personal choice to rise above the circumstances,” Corbridge said. Hillemeier emphasized that amid much change, Penn State Health and Penn State College of Medicine have a shared destiny. “We are one family and one community.” For example, clinical trials conducted at the College of Medicine are a differentiator for Penn State Health, as scientific discoveries become real-world medical treatments. If you're having trouble accessing this content, or would like it in another format, please email the Penn State College of Medicine web department.